Earlier this month, Scholastic announced that 500,000 books were successfully distributed to young children wellness checkup sites across the country. This donation was made through work of the Scholastic Possible Fund and Reach Out and Read, a program focused on educating parents and caregivers about the importance of reading aloud to children from birth. This generous donation of books is essential for even the earliest of learners, with research showing the massive amount of brain development that takes place in a child's first three years of life. These early years of development are primed for parents and caretakers to help their babies' brain develop by doing things like reading aloud, talking, singing and rhyming (Remember, your child will not receive the same benefits by watching T.V. or listening to a CD about rhyming – they need your human contact)! What better way to educate parents about the importance of promoting early literacy skills than to encourage parents to read to children at the doctor's office? According to Scholastic's blog On Our Minds, "The book donation and distribution are part of a national partnership announced by former Secretary of State Hillary Rodham Clinton at the fourth annual Clinton Global Initiative America Meeting (CGI America) in June, 2014. The American Academy of Pediatrics (AAP), Reach Out and Read, Scholastic and Too Small to Fail are using a multi-pronged approach to ensure that medical caregivers have the information, tools and books they need to help families make reading aloud with their infants a daily practice." Massive book distributions like this are one of the many reasons I absolutely love Scholastic and miss being able to say that I work there (even if it was only a summer internship). The organization's belief that literacy is the birthright of every child is something that I could not agree with more. The right book at the right time can change a child's life! And the benefits of reading go far beyond the actual skill of literacy. The beauty of building strong readers is watching their young minds flourish and their confidence grow. Scholastic prides itself on striving to “Open a World of Possible” for every child around the world, and for that to be possible, access to the books kids want to read is key. To view the distribution details of the first shipment by state, click here. According to Scholastic, the second shipment is scheduled for early summer. I recently watched a recorded webinar from the Young Adult Library Services Association (YALSA) that featured tips for librarians to get reluctant teenagers reading more. Today's teens spend much of their free time plugged into technology, but reading a book can be just as much fun (if not more) than playing the newest video game or scrolling endlessly through your social media feeds. Young Adult librarian, book reviewer and ReadingRants.org founder Jennifer Hubert Swan led the webinar and reminded the audience that just because many teenagers aren't choosing to read for fun doesn't mean they have poor literacy skills. They just likely haven't found a book – that book – that really speaks to them yet. It is your job as a librarian to make that happen. Jennifer broke her tips down into three different categories: booktalks, programs and contests, and library displays. Because I found her tips so useful as an aspiring youth services librarian, I would like to share them with you. Keep in mind that these are tips for librarians, but could really benefit any parent, teacher, etc. who is looking to motivate teens to read. Booktalks: A booktalk is basically a verbal advertisement for a book, like a movie trailer is a video advertisement for a film. Booktalks are frequently given by librarians visiting high school classrooms and are meant to encourage a particular book or books to an audience. DIY Booktalk: Instead of having the librarian give a booktalk, flip the script and ask a student to tell the group about a book they recently read and enjoyed. Use prompting questions like, "Did anyone read a book about a vampire this summer?" or "Did anyone read a book that a summer movie was based off of?" to start get the conversation started. Genre-blenders: Try suggesting books that blend two genres together, like a supernatural mystery or a paranormal romance. Teens might discover a new kind of book that they didn't know existed! Gross-outs: Your mother probably told you there was never a place for poop jokes and fart noises – well a booktalk is an exception to that rule. Teenagers love to be grossed out by stuff, and many might be unaware that basically anything goes in today's YA literature. Why not find a scene from a book about booger eating or projectile vomiting? It sounds a bit crazy, but it will captivate your kids. Multimedia: Mix up booktalks with websites, book trailers and other videos. This will help spice things up and reach your more visual listeners. Pairings: Like fine wine and cheese there is an art to finding two complimentary objects. Try booktalking a fiction and non-fiction book together. You can also try pairing a book with a video, or even a video game with an audiobook. Mixing media is great way to attract to reluctant readers to the written word. Playlists: Some books are just meant to have a soundtrack. Have your group of teens come up with a playlist for a particular book's character and explain why they chose the songs they did. Reality TV Tie-in: Think of any crappy MTV or reality show you can come up with and find a book with a related theme. Ask the group if they watched a show like Teen Mom recently and then suggest a book where the main character experiences teen pregnancy, or get those viewers of The Bachelor reading a new story about a budding romance. Show and Tell: Grab a couple books with big pictures of high interest, like books about tattoos, travel or even Awkward Family Photos. It will get your audience picking up (and talking about) new books! Twitter: Trying having a Twitter booktalk challenge by making teens "sell" a book, movie or video game using 140 characters or less! Variety: Don't be afraid to switch up your booktalking formats. Choose a mix of graphic novels, audiobooks, films, popular paperbacks and more! Programs and contests: Libraries are known for their programming and it's a great way to get teens in the doors of the physical library. Once you have them inside, you have their attention. Anything But Reading: Use non-reading-related programs to get reluctant readers inside the library like a Battle of the Bands or a cook-off. Be sure to have a display of related books (in this case, popular musicians' biographies or cookbooks) available for teens to check out on their way out. Book Buddies: What teenager doesn't want to feel looked up to or appreciated? Pair a reluctant reader with a younger kid and inspire them both to read. With many high schools requiring a certain amount of community service before graduation, having a teen read to the elderly is also a great opportunity. Matching a teenager with a senior citizen who enjoys books but maybe can't read on their own anymore is a great opportunity for all parties involved! Book Spine Poetry: Have teens wander through the stacks picking out books based on the titles printed on the spine. Then have them turn those words into poetry by stacking the books on top of each other. This activity will get teens looking at and picking out books based on their titles, but it will also make them more likely to take a peek inside. Book Trailer Workshops: Have teens put their multimedia and technology skills to use and ask them to make a book trailer for particular titles. If your community has a local cable access channel, this is a great outlet to show off your area's local teens' skills! Brown Bag Books: Have teenagers look through the library for the most boring book covers they can find. Cover those books with brown paper bags and have the teens reimagine the covers. This is an excellent way to attract the artists and designers out there. Goodreads Accounts: Have kids sign up for a Goodreads account – an awesome social networking site for book lovers. Once signed up, the teens can connect with their friends, tag or rate some of their favorite books, and get suggestions on what to read next. Famous Last Lines: Inspired by John Green's book Looking for Alaska, challenge your teens to match famous people with their last lines said before death. You could also do a similar activity pairing the last line of books with their titles. Stump the Librarian: Challenge your teens by saying you can find each of them a book they want to read by the end of the year. This will give you a chance to interact with your readers on an individual reader and make reading more of a contest. Stupid Weird Book Hunt: Does your library's collection have weird books about stranded shopping carts or crazy flea market finds? Encourage your teenagers to find some of the strangest books your shelves have to offer and give the winner an even kookier prize. 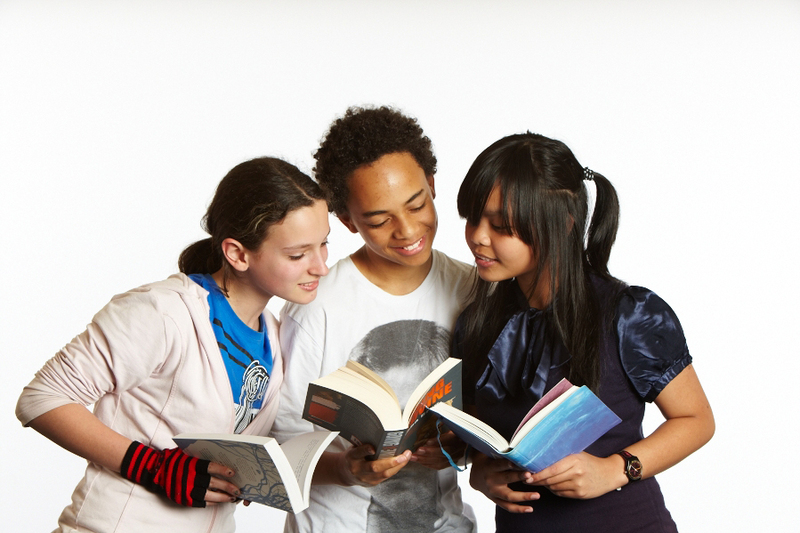 Teen Read Week: Visit the YALSA website fore more teen program inspiration. Library displays: Book displays are a great excuse to pull some books off the shelves and give them some more face-time with your teenaged patrons. Don't be afraid to get creative! As Good as Games: Pair circulating video games with tech heavy books like Artemis Fowl or Maximum Ride titles to reach those technology whizzes. ARC Shelves: Many librarians and reviewers are privy to Advanced Reader Copies of books. Pick up as many ARCs as possible at places like professional development conferences and create a unique section for them on your shelves. Signs like "Read it here first" or "Read it before it comes out" is a great way to make a reluctant teen reader feel like they have exclusive access to certain books. Banned Book Week: A lot of teens would be shocked to see some of their favorites on the Banned Book List – Harry Potter anyone? This activity is a great conversation starter for teens. Teens Top 10: Use a display to highlight some of the most popular books for teens, chosen by teens! Don't Shelve: A lot of patrons are interested in reading books that they know others have enjoyed. Make a "recently returned" shelf to attract reluctant readers to titles their peers have just read. Evil Geniuses: Make a display mixing fiction and non-fiction titles, video games and movies about evil geniuses trying to take over the world. Recommended by Magazines: Make a special display for books that have been recommended in popular magazines like People or U.S. Weekly, showing that reading can be popular and "in." Roaming Bookmarks: Have a group of teens make "Read-alike Bookmarks" to slip into some of the books in the stacks. Try pairing old classics with contemporary titles! Sob-o-Meter: Who doesn't like a good cry now and then? Make a display featuring all the the tear-jerkers you can think of a put plenty of Kleenex boxes nearby! YALSA Popular Paperbacks: Running low on ideas? Check out some of YALSA's themed booklists to help encourage reluctant readers to pick up more books! Happy St. Patrick's Day, and if you're on spring break like me, I hope you are enjoying your time off! No exciting vacations planned for me this spring break, instead I'm getting ahead on some grad school homework. Next week in my Library Materials for Young Adults class we are focusing on multicultural literature, which includes an assigned reading of The Absolutely True Diary of a Part-Time Indian by Sherman Alexie. I decided to get a head start on the novel, and it turned out to be quite the enjoyable spring break read! This coming-of-age story focuses on a 14-year-old Spokane Indian boy named Arnold Spirit Jr., also known as Junior. Junior, a budding cartoonist, and his family have spent their whole lives living on the Spokane Indian Reservation, a place plagued by destitute poverty, violence and alcoholism. With some strong encouragement from his reservation high school teacher, Junior realizes that he needs to leave the reservation if he ever wants to make a better life for himself, so he transfers to an all-white high school in nearby Reardan, Washington. One of Junior's many cartoons. Once at Reardan, Junior begins to go by Arnold, even though everyone back home on "the rez" calls him Junior. After facing initial culture shock and racism at his new school, he ends up as a varsity basketball player with a blonde-haired, blue-eyed girlfriend, named Penelope. Once a nobody subject to bullying on the rez, Junior suddenly finds himself as a popular (and secretly poor) student at Reardan. Throughout the novel, Junior struggles with his personal identity, proclaiming himself half-white, half-Native American – depending on whether he was at school or home on the reservation. As if figuring out who he was, is and will be, isn't hard enough, Junior must come to terms with sudden and tragic deaths of close family members and a ruined friendship with Rowdy, his best pal from the reservation. A hope-inspiring Bildungsroman, The Absolutely True Diary of a Part-Time Indian highlights contemporary challenges facing Native American reservation inhabitants with compassionate sensitivity and witty humor, as seen in the book's 65 cartoons "drawn" by Junior (actually illustrated by Ellen Forney). This creative story with its strong and unique voice will leave readers cheering for Junior well after the final page of the book. Alexie's novel is banned in many school libraries due to controversial content regarding alcoholism, poverty, bullying, poverty and sexual references. According to a study cited in a recent article published in the UK's The Independent, secondary students in England are being "seriously under-challenged" by the book they are given at school. "Professor Keith Topping, an education specialist at Dundee University and the author of the report, said: 'Primary school pupils, particularly in Years One to Five, show a strong preference for challenging books which are significantly beyond their natural reading age. We then see a marked difference in Year Seven where favoured books are no longer above chronological age, but six months below it and in ensuing years the difficulty of books plateaus or declines.'" The report gathered that many of these secondary school students are attracted to books that have recently been turned into movies such as The Hunger Games trilogy and The Fault in Our Stars, but dubbed them as too easy for the children's average reading level. To provide you with some context, secondary school in England is roughly the equivalent of middle school here in the states. And the success of Suzanne Collins and John Green's books among early teenagers is hardly a phenomenon unique to the UK alone. So wouldn't this mean these books too easy for our young American readers too? The report goes on to state that, "Secondary teachers and librarians need to get better at encouraging children appropriately,” as in, they need to be suggesting more difficult books. Yes, ideally a child would be mentally challenged by the books they are reading, but are you really going to put the blame on the teachers and librarians? At least these children are reading, and more importantly – they're getting joy out of it! Countless studies show that children are more likely to enjoy a book and willingly choose to read it when the book is something they have picked out themselves. Yet, this report seems to suggest that it is teachers and librarians jobs to tell these kids not to read these Young Adult books. But wait a minute ... I see adults reading, watching and talking about The Hunger Games, The Fault in Our Stars and loads of other YA titles. Surely these books are also below their reading levels. Are you meaning to tell me that they shouldn't be reading them either? As someone who works in a public library where it is my job to help readers find books that interest them, I can't imagine turning them away from a particular title – especially a child who wants to read. Yes, a kid could perhaps get more mental stimulation out of a book that is a bit more challenging, but that could also push them away from wanting to read. In my opinion, one of the most important things for children to develop during their youth is an early love for reading. Once that habit is set, their tastes in literature will change and evolve, just as they will. More difficult books will come as they get older, and if they don't? They'll still be ahead of all the kids who weren't reading anything at all. Today marks the 15th World Book Day, a celebration of authors, illustrators, books and – most importantly – a celebration of reading! In honor of the global event, let's take a look at some unique and unconventional libraries around the world! Since 1990, teacher-turned-mobile-librarian Luis Soriano has been bringing books to thousands of children in rural Colombia – all from the back of a donkey. The "biblioburro" provides poor children with more access to books, and thus an opportunity for better education. Soriano has perhaps seen the biggest honor he could have received: a children's book written about him and his burros, called Waiting for the Bibioburro, by Monica Brown and John Parra. Proceeds of the book sales help benefit Soriano's work. Photo via Lao American Magazine. In an effort raise public awareness about endangered Asian elephants and promote literacy in rural communities in Laos, an organization called Room to Read teamed up with local government and two other NGOs (Action with Lao Children and ElefantAsia) to create an elephant mobile library. Stocked with 640 Lao-language children’s books – many of which feature elephants – and supplementary educational materials, the library’s maiden voyage included four primary schools that serve more than 1,000 students in the northern province of Xaybouly, according to Lao American Magazine. The camel library service is an innovative initiative led by the Kenya National Library Service that has received a lot of praise for its effort in promoting literacy and reading in North Eastern Kenya. According to KNLS, "the use of camels as a transport means to carry books to the nomadic communities started in 1985 and has gained a lot of interest in the community. The mobile camel library is a common feature at semi-permanent homesteads and the sparse grazing lands." Villagers from Westbury-sub-Mendip in Somerset, England have 24-hour access to their neighborhood library, found in an iconic red phone booth, or as the British say, a "phone box." The little library offers 100 books in addition to DVDs and and CDs. Norway is a country known for its mountains and fjords, making transportation a bit tricky for some people to make it to a stationary library. But there is no lack of coastline in the Scandinavian country, making the open sea a Norwegian bookworm's best friend. Behold Epos, the book boat! The floating library contains more than 4,000 books and audiobooks and is a great way to reach some of the country's western communities that lack their own libraries. Epos is an extremely popular mobile library, especially for children. But it's not like the United States is a stranger to unconventional libraries. From vending machines to wheelbarrows, Americans get their books in pretty unique ways too – and we have for a long time. Check out some of these old photos of unorthodox libraries from the USA's past! A booketeria in a Nashville, Tenn. supermarket. Photo via the Nashville Public Library. Packhorse librarians pose in Hindman, Ky. Photo via the University of Kentucky's Goodman-Paxton Photographic Collection. A Works Progress Administration Bookmobile visits Bayou De Large, La. Photo via the New Deal Network. Celebrate World Book Day by checking out the book My Librarian is a Camel to learn more about how books are brought to children around the world! A few days ago, I was flipping through my grade school yearbooks and reading what my classmates and teachers had scrawled throughout the pages. The one that stuck out most in my memory was from my kindergarten teacher, Miss Grenzow: "...keep reading and writing." It's hard for me not to smile when I say those words back to myself so many years later because of just how far those "skills" (read: hobbies) have taken me. It's clear that my affinity for the written word began at a young age, and my growing passion for books was certainly not going unnoticed. When most kids in my class were being given one book a week to take home, Miss Grenzow was giving me three or four. I was coming back to school having gobbled up every word in each book I was given, hungry for more. I tell this story because if I was limited to choose one thing to attribute my success in life thus far, it would have to be an early love and understanding of literacy. And thankfully, that passion was strongly nourished and encouraged by my parents and great teachers like Miss Grenzow. To be honest, I consider myself lucky. To have the ability – and more importantly, the desire – to read from such a young age isn't as common as I wish it was. "At kindergarten entry, about one-third (31 percent) of children understand the letter-sound relationship at the beginning of words and about one in six children (18 percent) understand the letter-sound relationship at the end of words," according to the 2002 National Center for Education Statistics report, "Children's Reading and Mathematics Achievement in Kindergarten and First Grade." By the spring of first grade these numbers change dramatically, illustrating just how much literacy progress is made during the first few years of a child's schooling. Data via the 2002 National Center for Education Statistics report, "Children's Reading and Mathematics Achievement in Kindergarten and First Grade." As you can see, most kids make large strides toward literacy in kindergarten and first grade, but what about the children who don't? According to the U.S. Department of Education more than 60% of K-12 school children are reading below the level of proficiency that is required for the brain-work of reading to be transparent to the mind-work of learning at the grade level they are in. Just as the positive effects of literacy cannot be underestimated for the future success of a child, neither can the effects of not reading. Below is an excellent video shown to us in my grad school class, Library Services for Children and Young Adults, that addresses the personal and social cost of illiteracy. As you can see, literacy has much larger implications than simply fulfilling a class assignment or learning about a new topic. Children who struggle to read are much more likely to turn into adults with higher rates of drug use and incarceration, and that's just a small look at the overall picture. A large part of the literacy discussion is "How can reading help my child" or "What is my child missing out on by not reading?" But perhaps the more important question to be asking is what are the risks associated with not picking up a book, and how can we remedy that situation? *To learn more about illiteracy among young teens, click here.